I have a close family – we are always in and out of my parent’s house especially in the summertime. I think checking to see what’s in their fridge is a mandate whenever we are there. I stopped in last summer while they were away for a weekend. My mom told me she left a hardboiled egg in the fridge and that I could have it if I wanted. 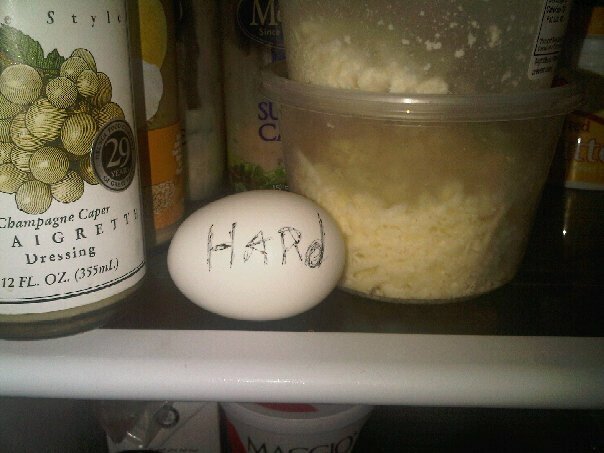 I get there and see that there is NO mistaking which egg is hard boiled! What a goof!!! that is awesome!! we didnt grow up like that – so seeing this was really bizarre and hysterical.